Everyone loves to see an elaborate gingerbread house on display over the holidays, but not everyone wants to get out there and put one together. It’s not that they’re so difficult to bake, just that they’re time consuming and many of us are simply too rushed around the holidays. On one hand, that might be the perfect reason to slow down and bake a gingerbread house. 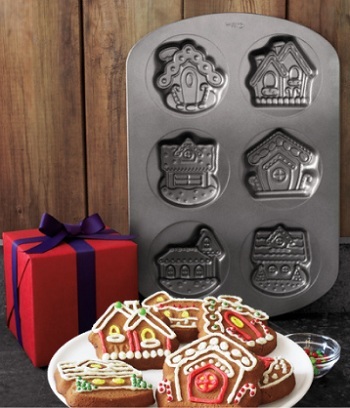 On the other, it’s a good reason to try out the Wilton Gingerbread House Cookie Mold. This pan has six cavities, each shaped like a different gingerbread house. Simply press your favorite gingerbread cookie dough (or use the recipe that comes with the pan) into the pan and it will bake up into a lovely gingerbread house with no effort on your part! 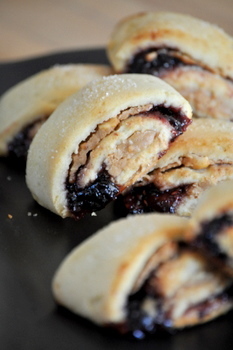 The pan is nonstick and makes cookies that are about 4-inches high. The details come through fairly well once the cookies have baked, and they can be served as-is or decorated to give them more of a finished gingerbread house look. You’ll have to bake in batches, but overall this is a neat way to bake gingerbread houses over the holidays and makes cookies that are far more transportable to holiday parties and gatherings than bigger, three dimensional houses are. Cute! I love all things gingerbread! I love this idea. I love hot homemade gingerbread, but the house are so much work! This looks like something I would love to try.